We all know Hong Kong loves Johnnie Walker Blue Label (which was certainly evident at the Johnnie Walker Blue 2015 launch we attended last year), and whatever your stance on blends, the fact remains that "JW Blue" is always a popular gift option, especially around Father's Day. 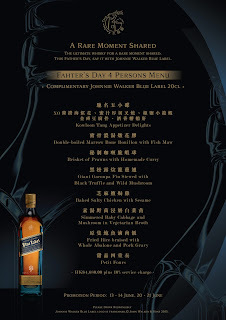 Enjoy a special set menu at Kowloon Tang through June and enjoy a complimentary 20cl JOHNNIE WALKER® Blue Label to savour with your father. Promotion Date: 13, 14, 20, 21 June 2015. 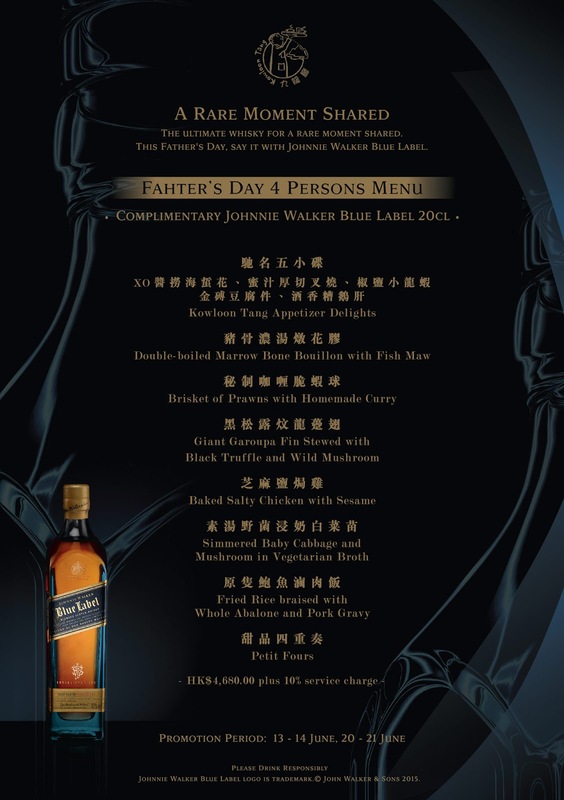 An exquisitely hand engraved message onto your father’s bottle of JOHNNIE WALKER® Blue Label or John Walker & Sons Collection with a purchase of HKD3,500 of selected Johnnie Walker product. Promotion Period: June 1 2015 onwards. To celebrate Sogo’s 30th Anniversary, JOHNNIE WALKER® is honoured to offer this special collaboration with Sogo. Inspired by dahlia, the motif representing Sogo’s 30 Anniversary, the bottle is exquisitely and elegantly designed. 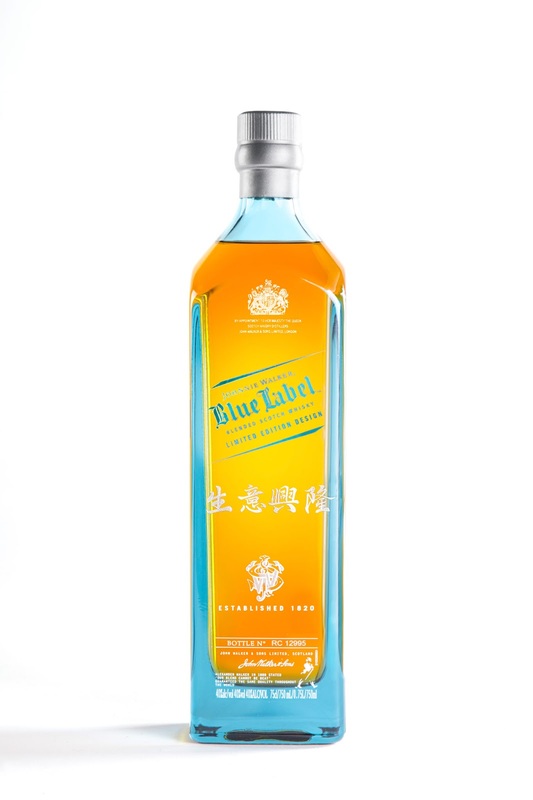 Paired with JOHNNIE WALKER® BLUE LABEL liquid, which only 1 in 10,000 casks containing whisky of sufficient character to deliver its smooth signature taste, this limited release is a one-off collaboration showcasing a remarkable partnership between two iconic brands. Promotion Period: To redeem a pair of crystal glasses upon purchase on 27 May – 16 Jun. Two lead crystal JOHNNIE WALKER® Blue Label signature glasses (not available to purchase separately) are offered upon any purchase of JOHNNIE WALKER® Blue Label 75cl. Promotion Period: Now until 31 July 2015. 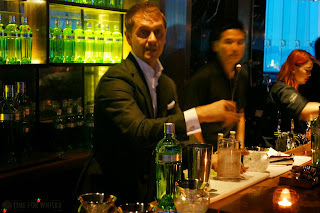 ...and when it comes to cocktails, there are few better experiences than the annual Diageo World Class competition, which sees bartenders globally competing in a range of events for the title of "World Class Bartender of the Year". 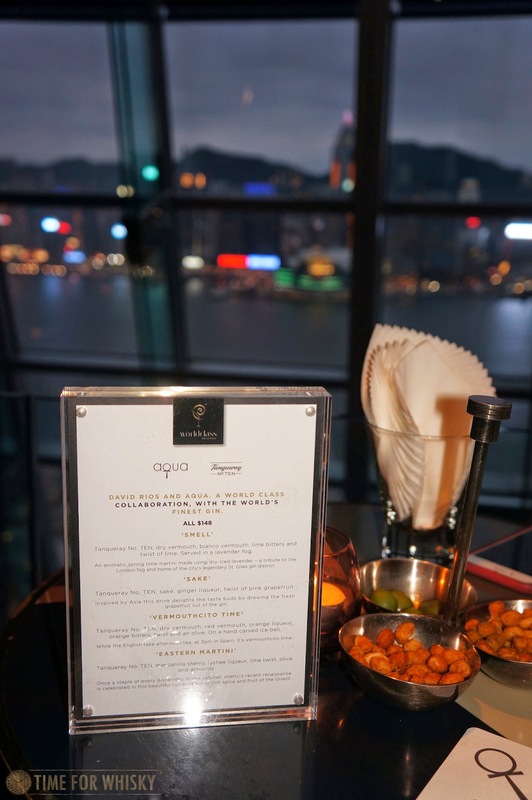 The event was to celebrate the launch of a new exclusive menu of four martinis, developed as a collaboration between aqua and David Rios and served in bespoke glassware, available only at aqua spirit from now until the end of June. 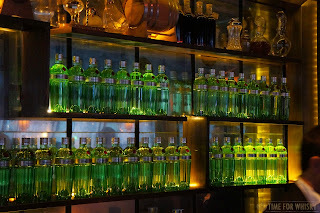 Almost instantly on arrival at Aqua Spirit's 30th floor location, we were handed the first cocktail - a Vermouthcito Time, consisting of Tanqueray No. TEN, dry vermouth, red vermouth, orange liquer, orange bitters and an olive, served over a hand carved ice ball. Whilst not usually a martini drinker, this was one cocktail I'd happily request a second time, and was not entirely dissimilar to a white Negroni (a regular Negroni being one of my favourite non-whisk(e)y cocktails). Next up was the more traditional Eastern Martini, made with Tanqueray No. TEN, manzanilla sherry, lychee liquer, a line twist, olives and almonds, served in a coupette. Designed to pay homage to the "enjoyment of Sherry by expats in Hong Kong in bygone years", the cocktail was a sweeter take on the martini, but equally as enjoyable as the first. 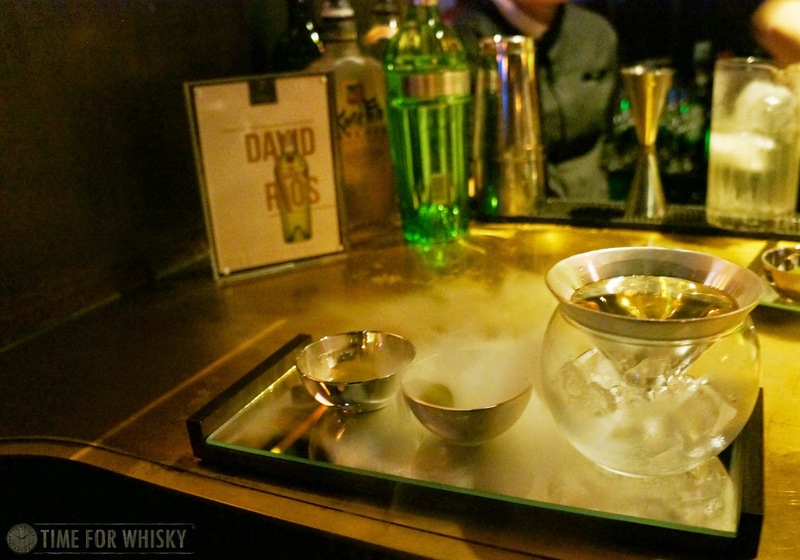 Before long, it was time for David to present his signature cocktail (also on the menu) - the Smell. David took charge of the bar and (with just the right amount of showmanship) showed us how he creates this aromatic take on the martini, made with Tanqueray No. TEN, dry vemouth, bianco vermouth, lime bitters, a twist of lime and served in a "lavender fog". Visually stunning, and when enjoyed from the signature metal, stemless cone-shaped vessel (above), a fantastic experience - made all the more impressive by aqua spirit's stunning backdrop (honestly, no-one could ever tire of that view). 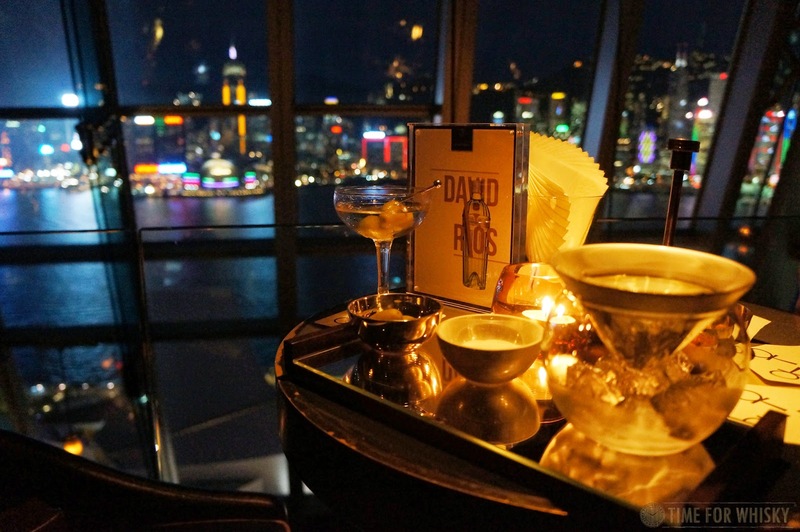 With the show over, it was time for guests to enjoy David's creation and the fantastic canapés (which, par for the course with any MHDHK event, were excellent). 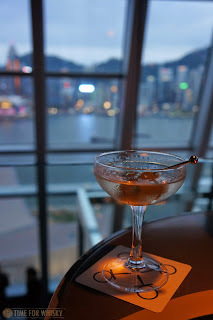 A fourth cocktail, Sake, though not served on the night, draws on Tanq TEN's grapefruit notes, with sake, ginger liquer and a twist of pink grapefruit. The night, which saw guests mingling, chatting to David, enjoying martinis and soaking in the view, was a brilliant, intimate launch and a perfect way to sample the new menu. The new martini menu is available now at aqua spirit, and will end at the end of June. 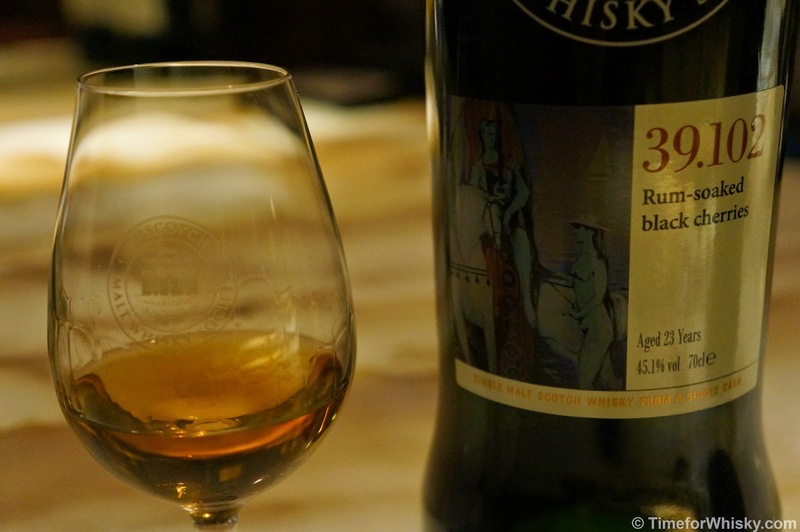 Probably somewhat unsurprisingly, when Steph and I visited The Society in Tokyo (as part of our JapanTour14), we tried a few Scotch Malt Whisky Society drams. Namely, a 20 year old Glenlivet and a 22yo Karuizawa. Nose: Fairy floss, followed by toffee. Palate: Initially hot, but quickly settling to smooth, gentle mouthfilling pleasantness. Whipped cream (but not too sweet), meaty and thick, but also with notes of tropical fruits, and then candied fruits. Slight hints of orange peel and marmalade. Finish: Short to medium length, with final notes of creme brûlée. Rating (on my very non-scientific scale): 93/100. Nose: Closed up at first - grassy, candied lemons (even Yuzu lemons). A drop of water brings out more sweetness, in the form of sherbert. Palate: Hot, so rich and full of plums, then sherbert (again), and finally licorice. Finish: Slightly drying, spicy. Cherries. Very long, with the tiniest waft of smoke. Rating (on my very non-scientific scale): 94/100. Fantastic, and not just because of the Karuizawa mystique (we tried one absolutely terrible Karuizawa on the trip too - not an SMWS bottling). 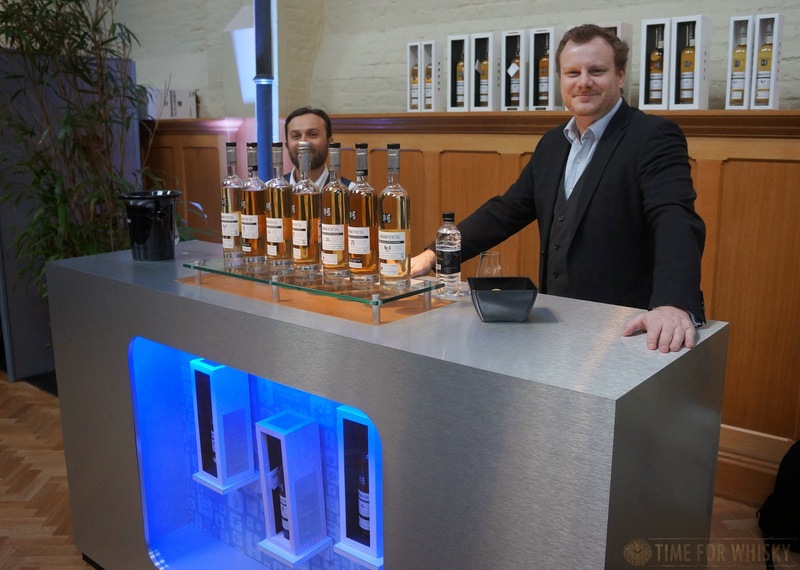 As you might know if you read this blog regularly, we get a fair few interesting press releases and news articles here at TimeforWhisky, and usually try to feature them with our own spin, experiences or comments. Sometimes though, they come thick and fast, and we just don't have time to do them all justice. You'd think the good folks at Ardbeg would have their hands full around this time of year, what with Ardbeg Day just around the corner, but apparently they've found time in their busy schedules to unveil the first ever Artbeg exhibition, to be launched at the distillery and online today. Artbeg comprises 20 complex, layered artworks, created by photographer Peter Heaton, that "evoke the intriguing heritage and unorthodox personality of Ardbeg and its homeland, the small Scottish island of Islay." 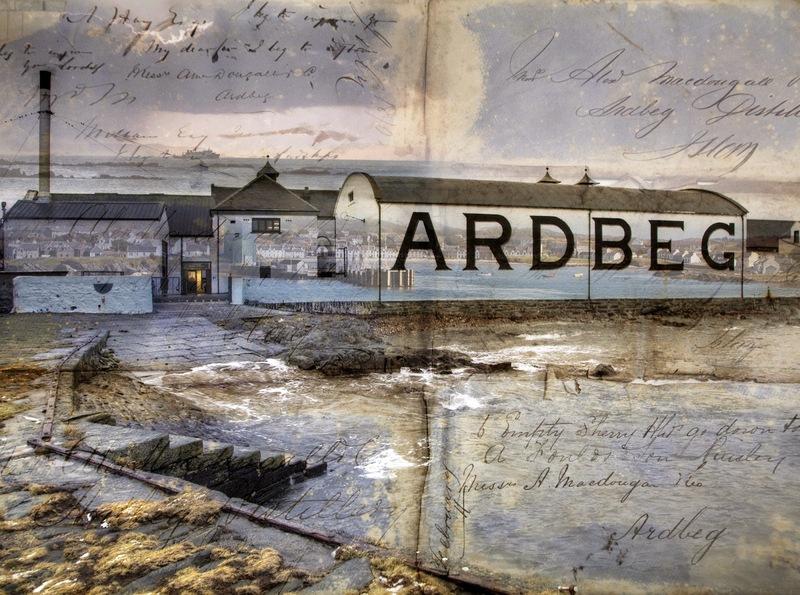 The exhibition will be displayed on the outer wall of the Distillery’s West Maltings building and a selection of works will also feature on www.ardbeg.com. Distillery visitors will be able to share their impressions of the Distillery on the website by uploading their own photographs. 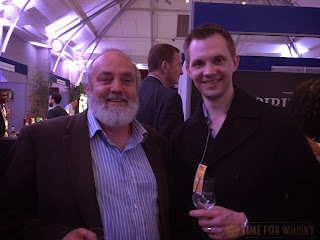 Peter Heaton said: “I have always had a fascination with Islay and its single malts, particularly Ardbeg. The exhibition interprets the Distillery over time and I wanted to create layered, complex imagery which would encourage people to give the work some time and think about the theme of past, present and future. 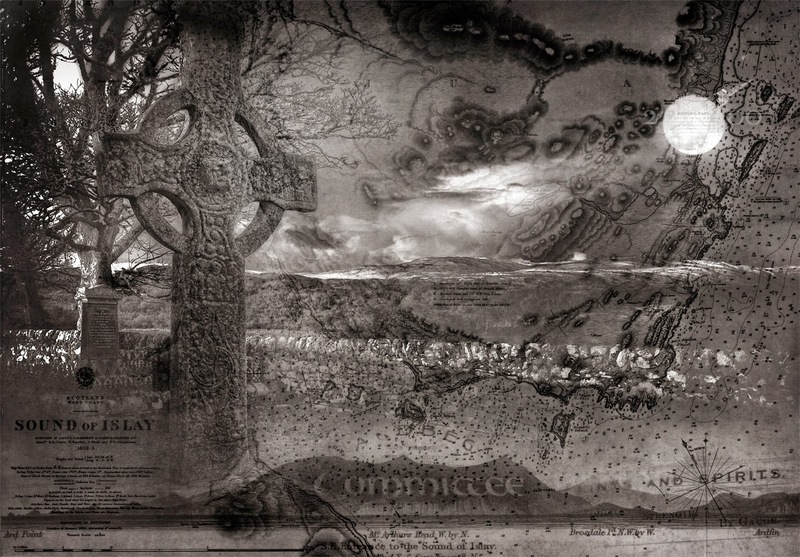 Mickey Heads, award-winning Ardbeg Distillery Manager, said: “This exhibition provides an intriguing twist on the story of Ardbeg – and contains more than a few surprises. 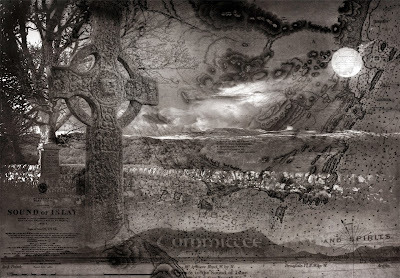 The complexity of these remarkable images makes you stop and think about the whisky’s heritage and its future”." To attend Ardbeg Day events across Australia on Saturday 30th May, sign-up to the Ardbeg Committee at http://www.ardbeg.com. The Oak Barrel in Sydney (who we like so much on this blog they have their own tag), are bringing their excellent Whisky Fair back again in 2015, to be held Friday 21st and Saturday 22nd August. Tickets are $80 / $90AUD (members / non-members) and, if the show is anything like it has been in previous years, that'll be money very well spent (especially seeing as, in previous years, there's been at least one special bottling bottled specifically for the show, not to mention a variety of drams you just don't see at other whisky shows in Australia). Further details can be found here and here, and we recommend getting tickets ASAP as these do sell out. Almost 180 drams ago, we tried the original Laphroaig 15yo (which at the time we'd managed to get for a very decent price). Fast forward almost 2 and a half years, and the 15yo is back, hitting Australian shelves for a limited time to celebrate Laphroaig's 200th anniversary. "A long revered expression in the Laphroaig range, Laphroaig 15 Year Old was originally launched more than 30 years ago, with a lower level of peat and a higher bottling strength of 43% all combining to give the whisky a mellow, rounded taste, its briny orchard fruits adding bite and depth, the overall feel rich and smoky. Laphroaig Distillery Manager John Campbell decided to re-release this product, one of his long-time favourites, in celebration of Laphroaig’s 200th anniversary. 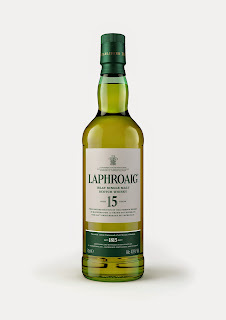 Beautifully made, Laphroaig 15 Year Old pays homage to the original edition, answering the call for its return by many a long term friend, while at the same time introducing new fans of Laphroaig to a whisky that they have yet to taste." Laphroaig 15yo is bottled at the same 43% ABV as the previous release, and is available now, retailing for around $180AUD. We hope to be able to put up our own tasting notes soon for the peat-heads amongst you, and do a comparison with the earlier 15. Over to Hong Kong now, where two very rare whiskies (one blend, one single malt) will soon be available, and a third, even rarer whisky (The Last Drop 50yo blend) is going under the hammer. 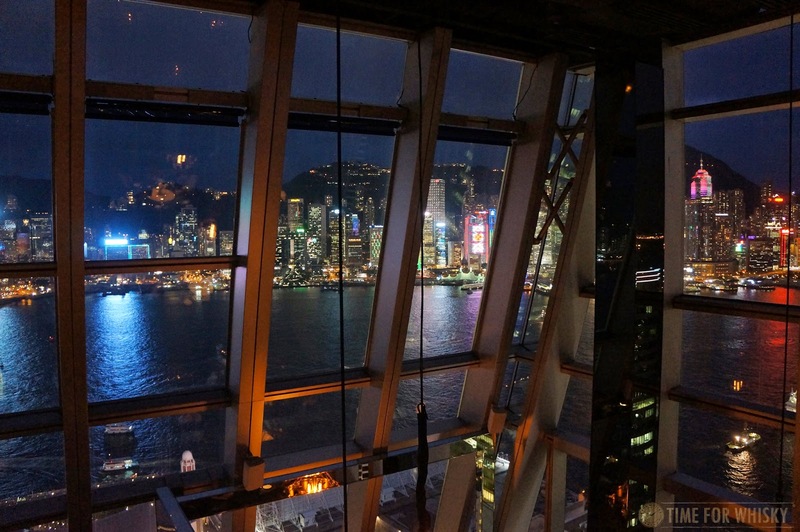 "Rare spirits hunters, The Last Drop Distillers Limited, are bringing an extraordinary treat to Hong Kong’s most discerning spirit enthusiasts and collectors by presenting a series of three rare and exceptional whiskies, including their award-winning fourth release – The Last Drop 48 Year Old Blended Scotch Whisky. Awarded “Scotch Whisky of the Year 2015” in Jim Murray’s Whisky Bible, the 48 Year old was launched in the UK in April, with only 592 bottles in existence. Now available in Hong Kong, 22 bottles will be available to purchase exclusively through Crown Wine Cellars. Alongside the 48 Year Old, The Last Drop Distillers will also present a remarkable 1967 Single Malt Whisky from Glen Garioch - one of the oldest distilleries in Scotland. 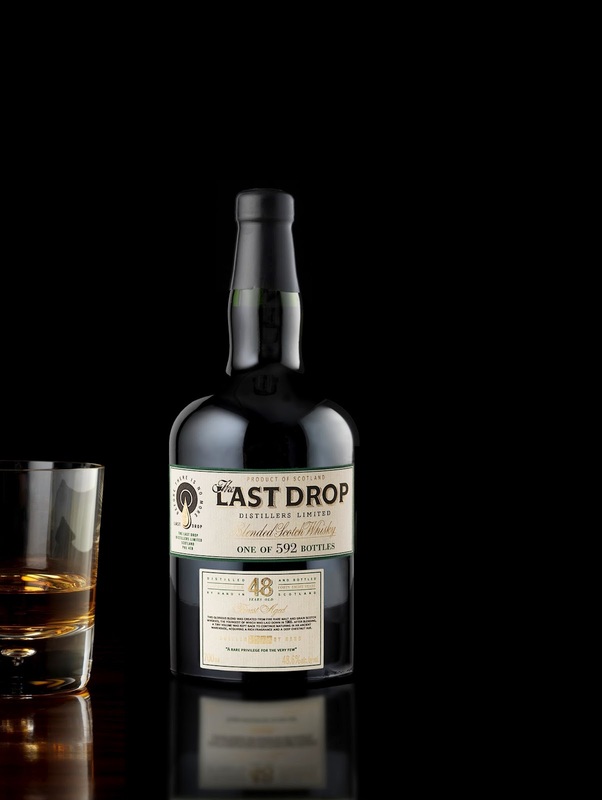 This release, planned to launch in August 2015, is The Last Drop’s first Single Malt and was awarded “Scotch Single Malt of 2015” (Jim Murray) with only 118 bottles available worldwide. The third whisky presented will be The Last Drop 50 Year Old Blended Scotch Whisky, released in 2014 and now all but sold-out worldwide. Awarded Best Blended Scotch Whisky of 2014 by both Jim Murray and The Whisky Advocate, Bottle No 1 will be auctioned at Sotheby’s on 23rd May, in celebration of Crown Worldwide Group’s 50th Anniversary, with all proceeds going to Hong Kong’s Sunshine Action Charity. The Last Drop Distillers was founded in 2008 by three long standing friends and veterans of the spirits business, James Espey, Tom Jago and Peter Fleck, who together have over 120 years of experience. 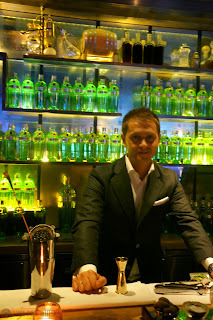 Between them, they have been responsible for the creation of some of the best known and best loved spirits brands including Chivas Regal 18 Year Old and The Classic Malts, as well as Malibu and Bailey’s Irish Cream, two of the most original and successful new drinks categories in the world. Now the next generation has come on board with Beanie Espey (Sales & Marketing Director) and Rebecca Jago (Creative & Production Director), James and Tom’s daughters respectively, joining the team. Together with the founders, they are committed to continuing the quest to identify spirits worthy of The Last Drop bottle." 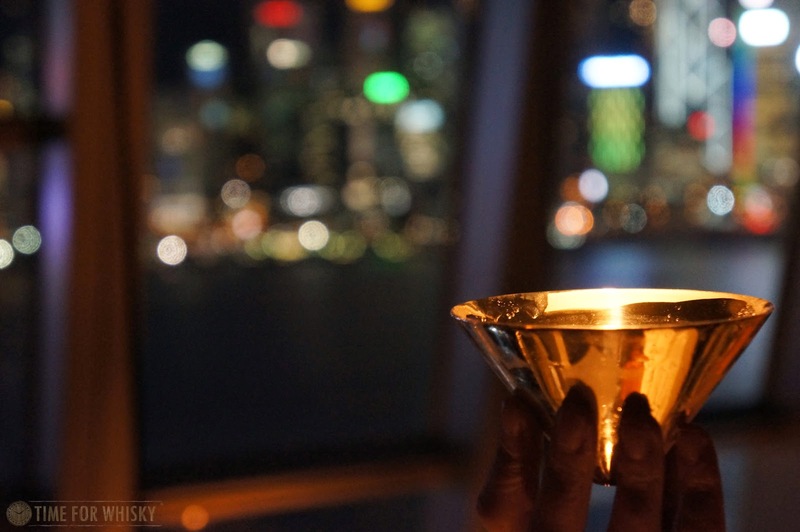 Available to purchase exclusively through Crown Wine Cellars, connoisseurs and collectors will be able to purchase The Last Drop 48 year old from May 2015, RRP HK$33,888. 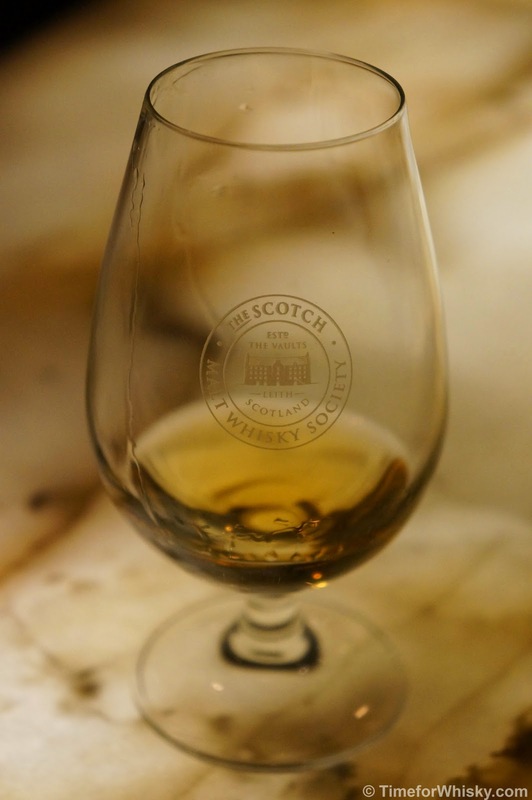 The 1967 Glen Garioch will be on strict allocation, in advance of its release in August 2015. To pre-order a bottle, please contact the team at Crown Wine Cellars. 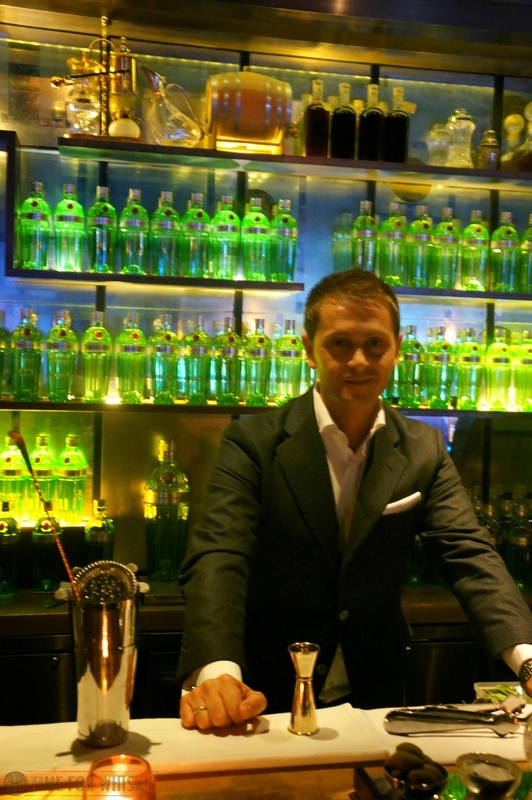 Sotheby’s will auction bottle No. 1 of The Last Drop 50 Year Old Blended Scotch Whisky on 23rd May. The last remaining five bottles of The Last Drop 50 Year Old are likewise available to purchase from Crown Wine Cellars. You know how occasionally things just work out incredibly fortuitously? 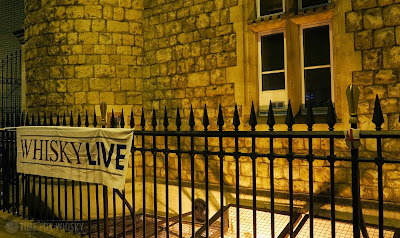 Whisky Live London was one of those occasions for me. I had to be in London for 4 days for work. Having not been for a few years, I decided I'd take the Friday as leave rather than head home a day early - figuring it shouldn't be too hard to find something to do in London for a day. 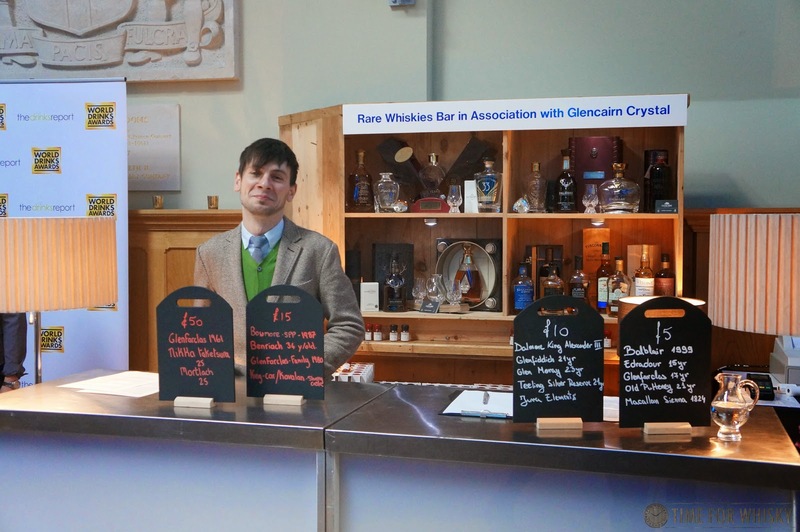 I got in early the weekend before too, had a great time bar-hopping with this bloke, and at one point dropped by the SMWS bar in Greville St, London, where I got talking to Martyn, The Whisky Cyclist. Upon hearing I was only in town for the week, Martyn asked was I going to Whisky Live on Friday? "Umm...well I bloody well am now!" was about all I could manage. I genuinely had no idea it was on (which was surprising, considering how many UK bloggers I follow on Twitter), but it looked like I'd sorted out my Friday! Even better - just before plonking down £50 on a ticket, I noticed Whisky Live were offering media passes for an early media/blogger session. So with one of those sorted, all I had to do was wait for Friday to roll around. I was excited to visit Whisky Live London because I'd heard good things (and generally, from what I could tell, major whisky shows held in the UK have been pretty high quality). 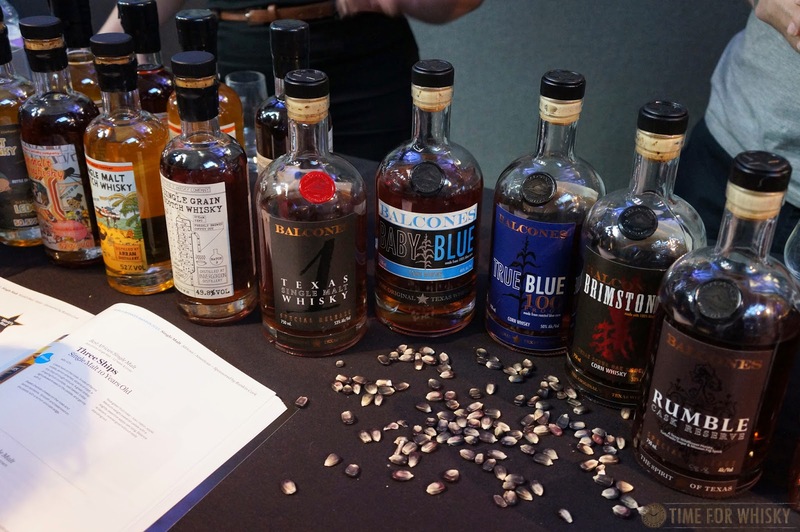 I was also keen to see how it compared with Whisky Live Sydney, which I don't consider a bad show at all, but in my opinion is more of a beginner show, as opposed to say The Whisky Show or Oak Barrel's Whisky Fair, who cater more towards the enthusiast. 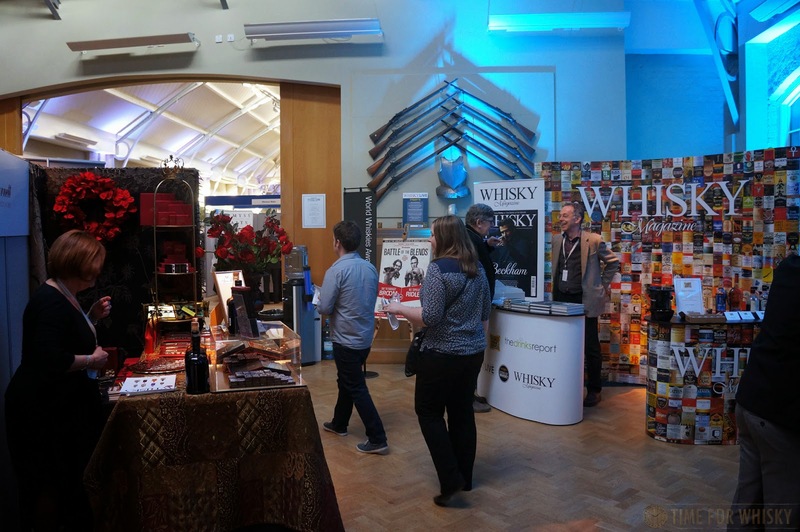 Arriving into the relatively empty hall, I quickly spotted a few familiar faces from the whisky blogging world - the likes of Dave and Kat from Whisky Discovery, Greg from GreatDrams and later the famous Joel Harrison (formerly Cask Strength, now Worlds Best Spirits). One thing that struck me first was that whilst a number of the big whisky companies were present, they weren't necessarily presenting the whiskies you might think. 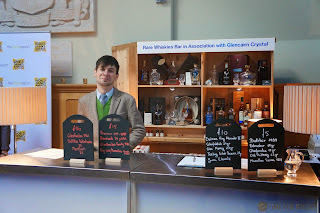 William Grant & Sons for example, had no Balvenie, Glenfiddich or Kininvie in sight. They did however have an impressive lineup of seven different Girvans. 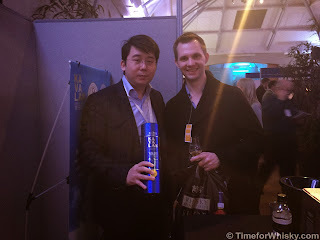 Diageo too were present, but with Mortlach (and yes, the new NAS Talisker Skye). 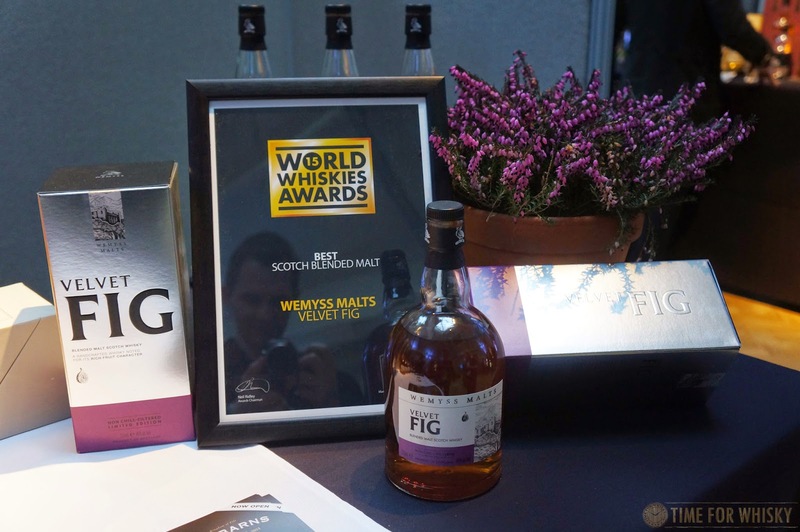 Then there was Wemyss Malts, Maverick Drinks (who are as entertaining in person as they are online), and Whisky Magazine presenting the full set of World Whiskies Awards winners (the competition having been held in London the night before). 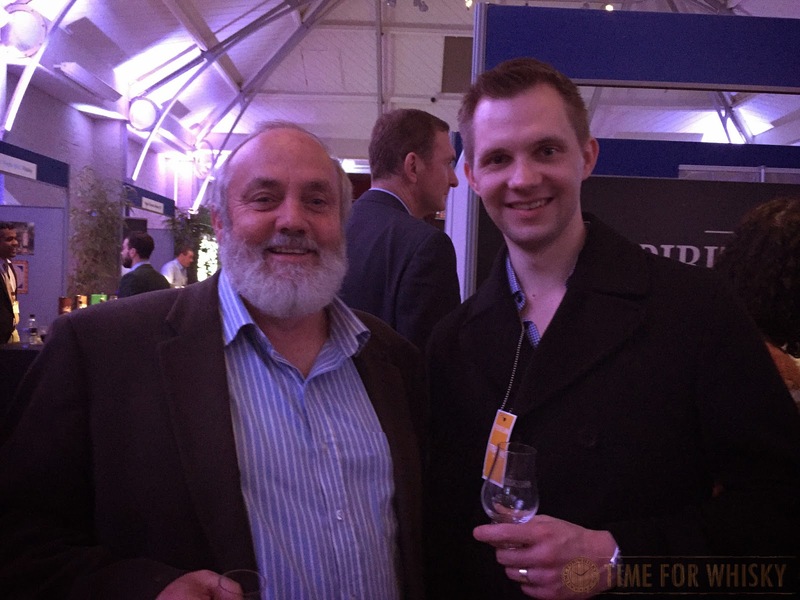 Unlike previous shows where we'd run into Bill Lark, Bill was there as a punter (from what we could tell), enjoying the show and as always, happy to chat to fellow whisky lovers. A legend (or should we say the legend?) 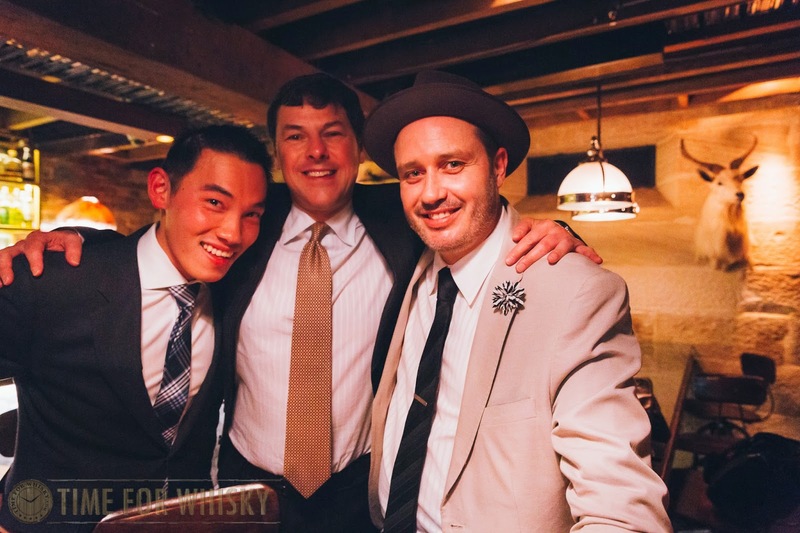 of the modern-day Australian whisky scene. 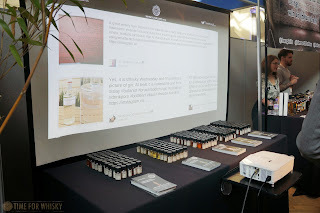 Maverick Drinks (known and loved for their fantastic range of Drinks by the Dram) had an interesting stand, with a number of expressions from That Boutique-y Whisky Company and Balcones (not a bad drop amongst them) and a live Tweet board, where you could tweet them, see your tweet in real-time, and score a dram for your troubles (a Batch 4 Arran from That Boutique-y Whisky Company, thank you very much). 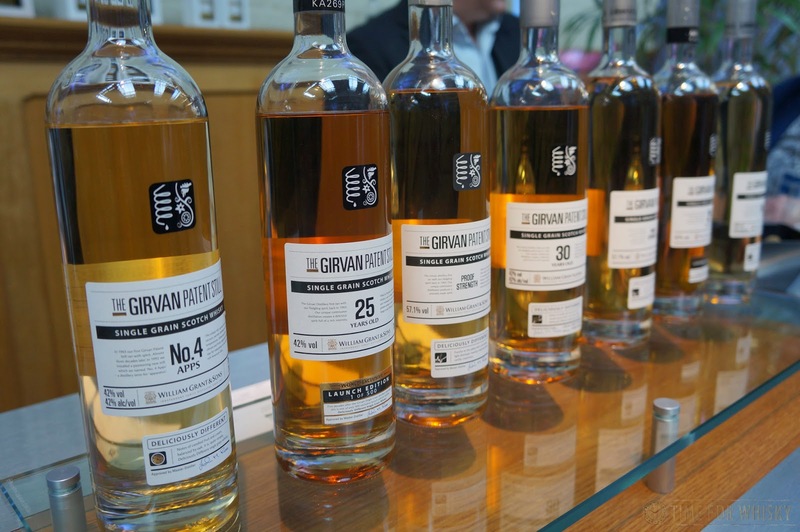 It might have been an "introductory" masterclass, but these certainly weren't "introductory" whiskies, with at least two of them retailing for £300+. A great experience though, with a very entertaining host in Stephen Marshall (ex-SWMS and current brand ambassador the Last Great Malts). After a few more drams shared with a few more bloggers, it was time to call it a night. Was it a good show? Without a doubt! With a line-up of some very interesting / not often seen whiskies, some great characters, an enjoyable masterclass schedule and the ability to taste the complete lineup of the World Whiskies Awards winners just a day after the awards, it was about the best possible way to spend a Friday evening. TimeforWhisky attended Whisky Live London as a media guest of Whisky Live (as we did in Sydney in 2013). 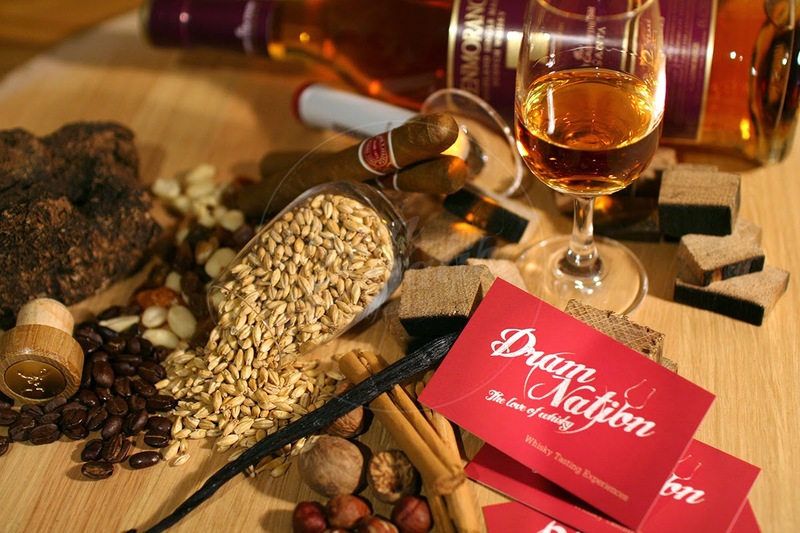 Good friend of TimeforWhisky, fellow whisky blogger and all-round nice bloke Matthew Wooler has recently launched Dramnation, which will run whisky appreciation courses based in Sydney's Hills District and surrounding suburbs. 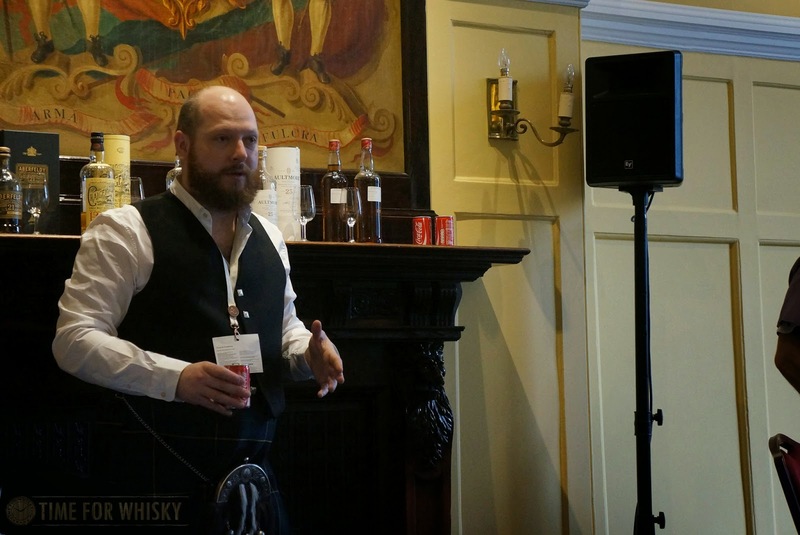 "Dramnation is a business created to impart knowledge about whisky appreciation through the tactical approach of speaker driven presentations, combined with measured whisky tasting samples and sensory exploration. We intend to nurture and focus a growing community of whisky appreciators in the Hills district. The Dramnation whisky appreciation course is to introduce individuals into the dynamically expanding world of whisky. 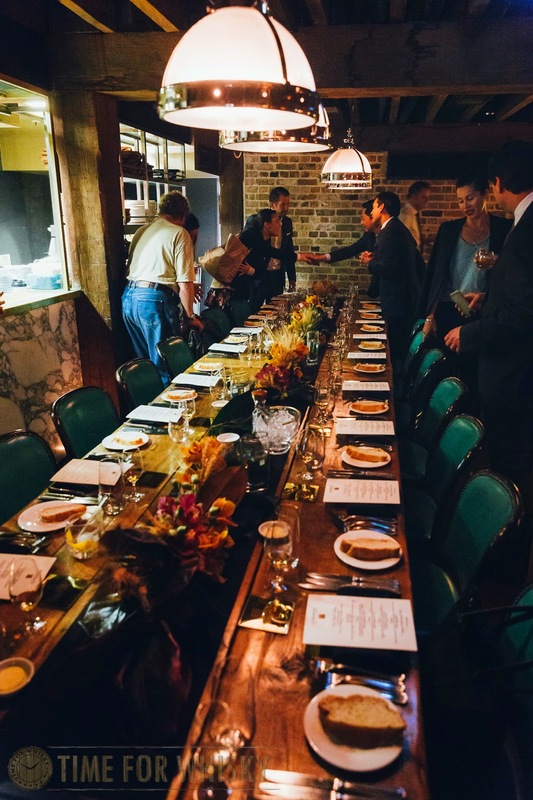 Through the 4 part course, each individual will have the opportunity to taste a minimum of 20 whiskies from both the traditional Scotch foundations and new world whiskies. 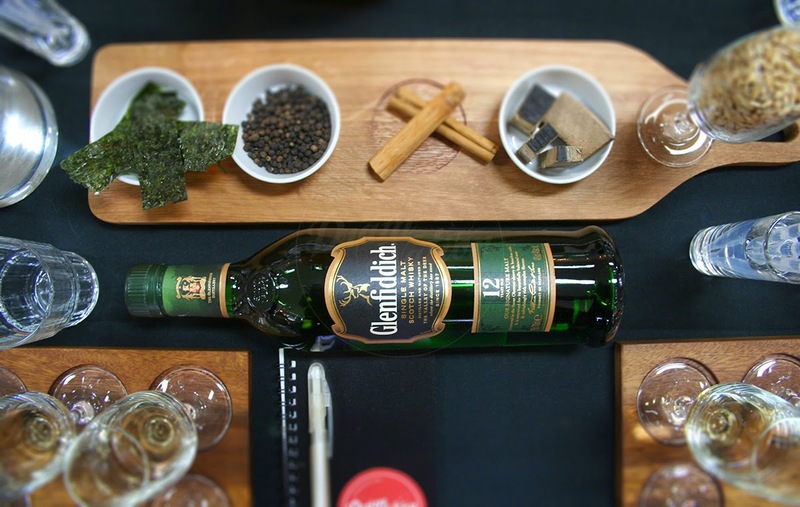 All samples tasted during the course will be drawn from whiskies readily available on Australian store shelves. 85% of all whisky samples to be tasted are valued at below $100AU and the remaining 15% valued at above $100AU. This ration is to ensure we deliver attendees a showcase of quality whisky that can fit an average whisky buyer's budget. Dramnation’s ultimate aim is to instill enough valued information to allow for a confident, educated decision making process when selecting and purchasing whisky at retail liquor chains or individual specialist stores. The Dramnation course will be held over 4 sessions of consecutive or alternating weeks. 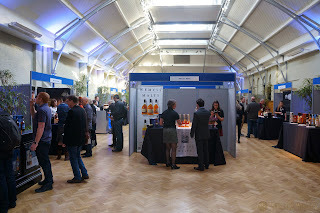 A minimum of x5 15ml whisky samples will be served at each session per attendee. It is intended to also include a small tasting of a beer, sherry, and port to give the link between malt to beer to barrel to finish. Tastings will also be accompanied with a light finger foods of cheese, crackers, mixed nuts, dried fruits, chocolate, with potentially some cured protein. " Those who have met Matt, or know of him through the Distant Thunder Whisky Club or Dram Full Sydney would know he has a genuine passion for whisk(e)y, coupled with a deep knowledge of the liquid we know and love - facts that will no doubt shine through in the soon to commence courses. Matt has shared with us a list of the 20 whiskies Dramnation will cover during the courses (not including the "mystery drams" that will also be available for purchase during the courses), and I have to say - they've built an impressive list of quality, but accessible drams. From Small batch Irish whiskies, to classic Speysiders, to Japanese NAS whisky, Islays, Islands, Bourbons and well-aged blends, it's all covered. It's actually a very impressive list and would be sure to give anyone a very solid grounding in the world of whisky / whiskey. As the photos show, Matt puts a lot of care into everything he does, and we have no doubt these courses will be a huge success (Hendy will hopefully be attending one soon). 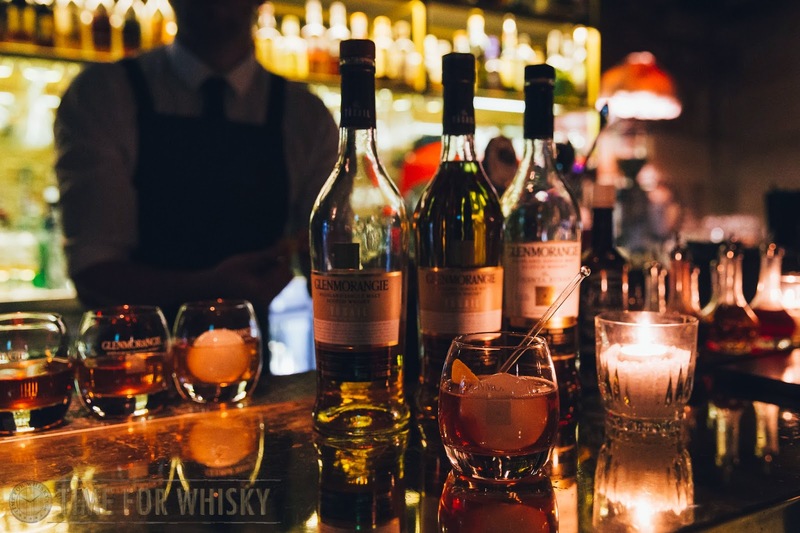 If you live in Sydney and would like to learn a bit more about whisk(e)y (or you know someone who fits that bill), we recommend you consider booking one of Dramnation's courses, stat. The photos provided for this article belong to Matthew and Dramnation - and just quietly, are stunning. As part of World Whisky Day, officially set on Saturday, 16 May 2015, Time for Whisky was invited to preview the tasting flights at Tokyo Bird ahead of the exciting day on which the world can have a dram (or five) and celebrate the water of life. 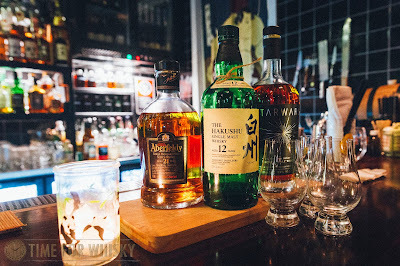 We previewed the tasting event a few days ago with all the details on how you can celebrate World Whisky Day (or in the case of Tokyo Bird, World Whisky Week) at their great little Japanese yakitori bar in Belmore Lane, Surry Hills. 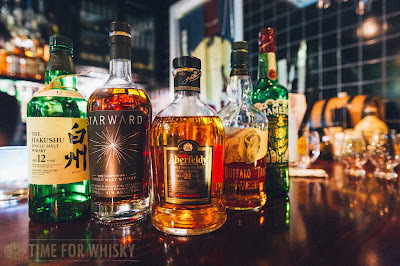 Tokyo Bird Bartender, Yoshi Onishi explained the selection of the three different whiskies and how they each pay homage to the different whisky regions; being Scotland (Highlands), Japan (Mt. Kaikomagatake) and Australia (Victoria) and allow one to appreciate the varying spectrum of whiskies across those regions. The Starward Wine Cask dram tends to lend quite a sweet, aromatic and tannic note from the use of the ex-Shiraz wine cask with the Aberfeldy also offering a level of sweetness though allowing a more floral, fruity, vanilla, citrus note to rise from its use of a combination between ex-Sherry and ex-Bourbon casks. The Hakushu on the other hand, like most of its Japanese whisky brethren is refined, balanced and clean - there are light and grassy, sweet fruit notes with a hint of smoke on the palate. Though, with the flight, what are the three whiskies like? I would have this dram on joyful or festive occasions, perhaps Christmas? The berry, gummy bear nose and the sweet creamy palate can simply complement those occasions. --------------------------------------------------------------------------------------------------------------------------A light, clean dram that you can have any time of the day, perhaps with your cereal or with your lunch. An innovative use of a different barley varietal, the "Marris Otter" winter barley gives way to a soft, refined and creamy expression. 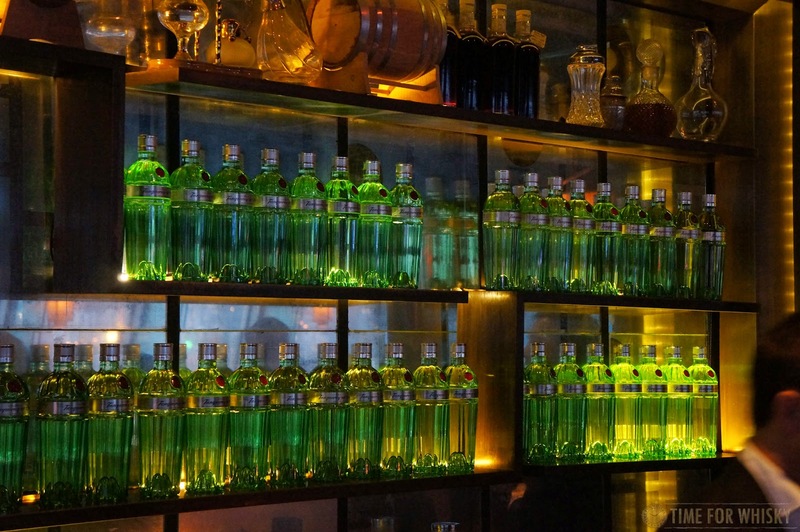 Palate: The palate is soft, smooth and light and the age has slightly represented itself through the creaminess on the. There are notes of almond shortbread and vanilla. Finish: The finish is long and the mouth coating, vanilla notes lingers. The three dram whisky flight provides a nice, balanced tasting that does not push one to any extremities (though other expressions are also available behind the counter). The flight is certainly ,quite easily, palatable to many, especially for those who may want to simply appreciate a flight of delicate, clean whiskies - for the sake of celebrating such fantastic water of life. The five dram whisky flight expands the three drams offering by including, the well known (and loved) Buffalo Trace bourbon and also the light and supple Jameson Irish whiskey. Both the three and five-taste whisky flights will be available from the official World Whisky Day – Saturday, 16 May – through to Wednesday, 20 May. 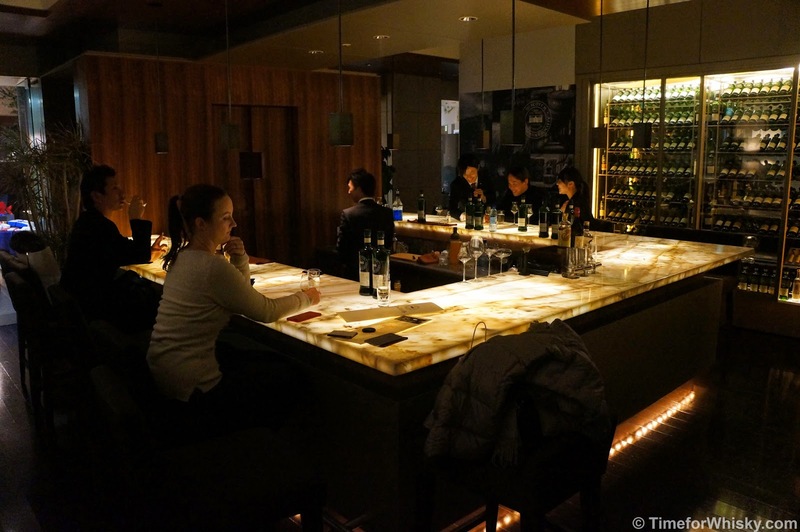 Full background and tasting notes and matching yakitori options will also be provided. 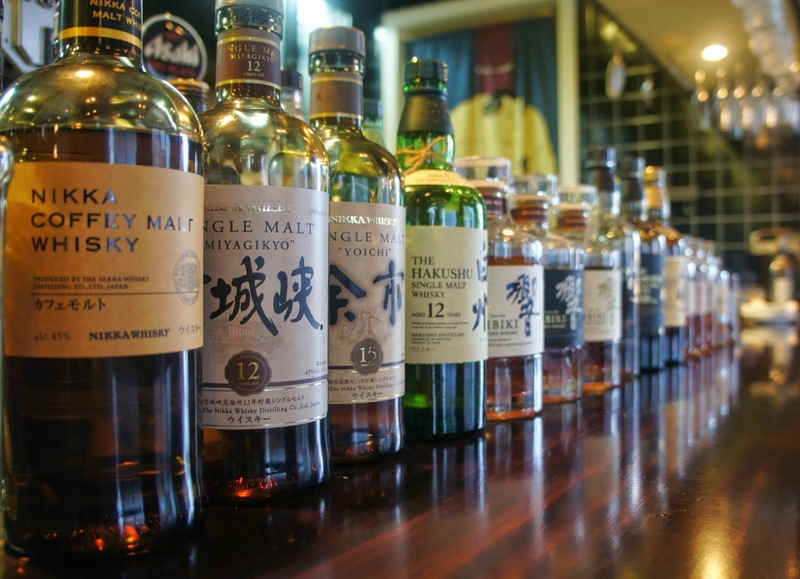 Bookings for World Whisky Day tasting flights from Saturday, 16 May to Wednesday, 20 May are available via info@tokyobird.com.au. TimeforWhisky.com would like to thank Jason, Tina and Yoishi of Tokyo Bird for the invitation and their hospitality when previewing the three-dram World of Whiskies tasting flight. 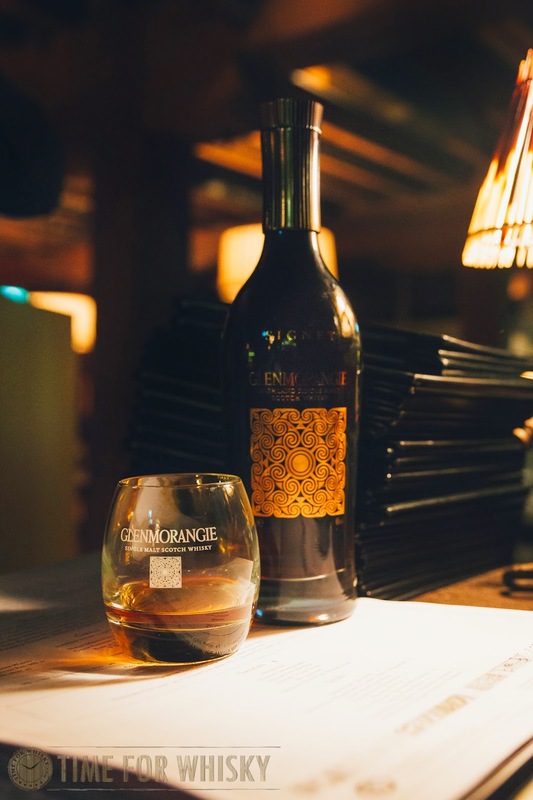 As highlighted in our "weekly" update (#18), Glenmorangie released in April, in Australia, the sixth Private Edition collection, the Glenmorangie Tùsail. To commemorate the launch of Tùsail, a number of whisky bloggers, lifestyle writers and PR representatives gathered at The Cut Bar & Grill for a dinner tasting of the Tùsail (amongst other Glenmorangie expressions) hosted by well respected whisky figure, Dr Bill Lumsden - Director of Distilling, Whisky Creation & Whisky Stocks at The Glenmorangie Company. Tùsail has ventured away from the artisanal flair of the previous Private Edition collections which have predominantly focussed on the maturation or the finishing and the use of different types of cask (as we saw last year with Companta and its use of the red wine barriques). The name Tùsail or Tùsailis is the Scottish Gaelic word for originary, which means ‘causing the origin of’ and the name Glenmorangie Tùsail was chosen as it best reflects the inspiration behind the whisky, with its use of a rare barley that carries with it a distinctive taste profile which was almost lost to the world. 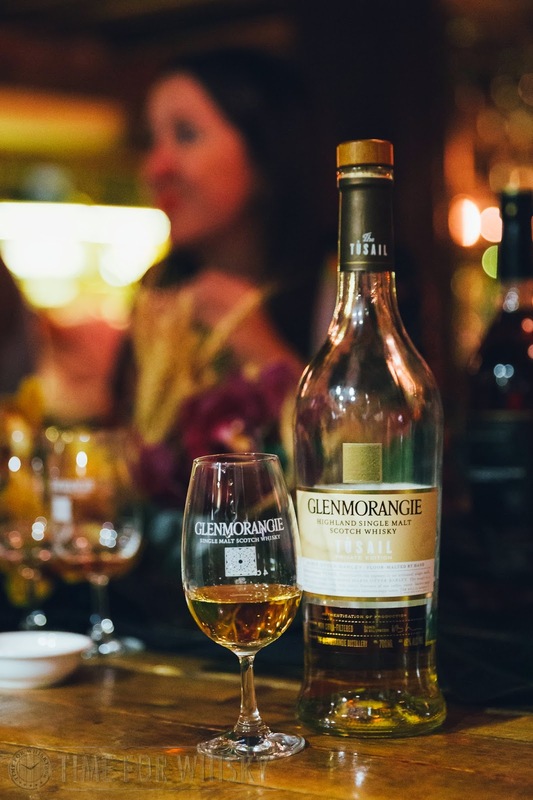 The curation of the Tùsail followed the inspiration that culminated in the Glenmorangie Signet, the dark, refined, coffee-brew inspired expression. The Signet focussed on the barley as opposed to the maturation with the use of the roasted 'chocolate' barley malt (as typically used in porter and stout) to produce an experience similar to that of waking up in the morning to the smell of a fresh roasted brewed coffee, as highlighted by Dr Bill on the night. Dr Bill Lumsden explains that with Tùsail, it makes use of a previously near-extinct "Maris Otter" barley, otherwise known as a winter barley which gives the whisky a depth of flavour and character that differs to other malt varietals, with notes of nuttiness, toffee, cinnamon and dates. The barley itself was first commercially harvested only 50 years ago and became a cornerstone of the craft-brewing industry in England as it was able to impart such depth of flavour. The use of the "Maris Otter" barley in Tùsail has meant that there is now a degree of preservation to this near-extinct barley. 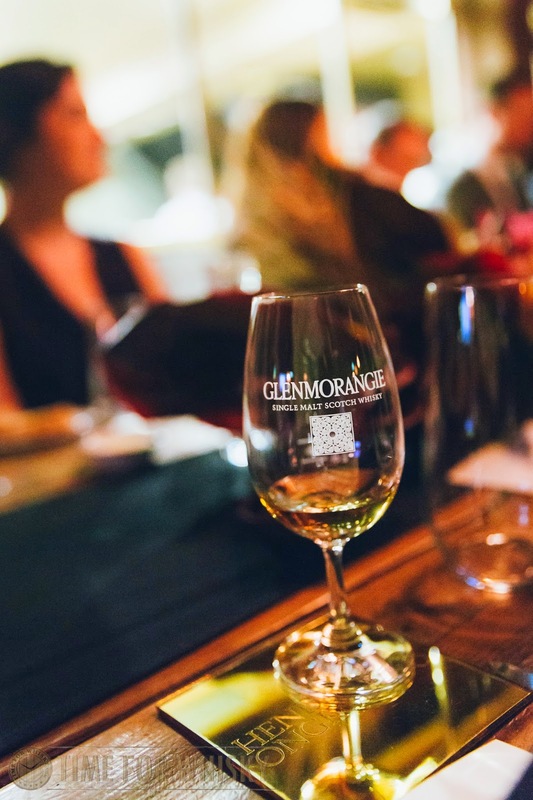 As compared to other Glenmorangie expressions, Tùsail shares some similarities to that of the Glenmorangie Original with its soft, floral and creamy notes. From the tasting (full tasting notes below), there are elements of sweet vanilla, spring flowers on the nose and creamy, toffee, apple notes on the palate - some similarities to the Original, which was also served on the night. The night kicked off with a varied expression of the Old Fashioned, otherwise known on the night as the Long Zest with its use of the Glenmorangie Original, bitters, ginger and flamed zest of orange. The Long Zest was a great, refreshing way to kick off the launch and a great take on the generally bourbon-driven Old Fashioned. 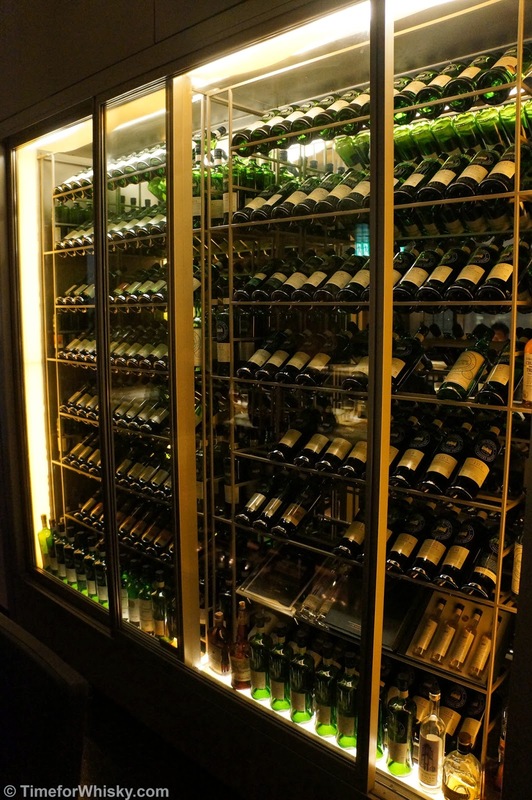 Known within the Sydney dining scene, The Cut Bar & Grill provides an intimate dining experience and is well known for its creative use of produce including its signature slow roast rib and flat iron steak. 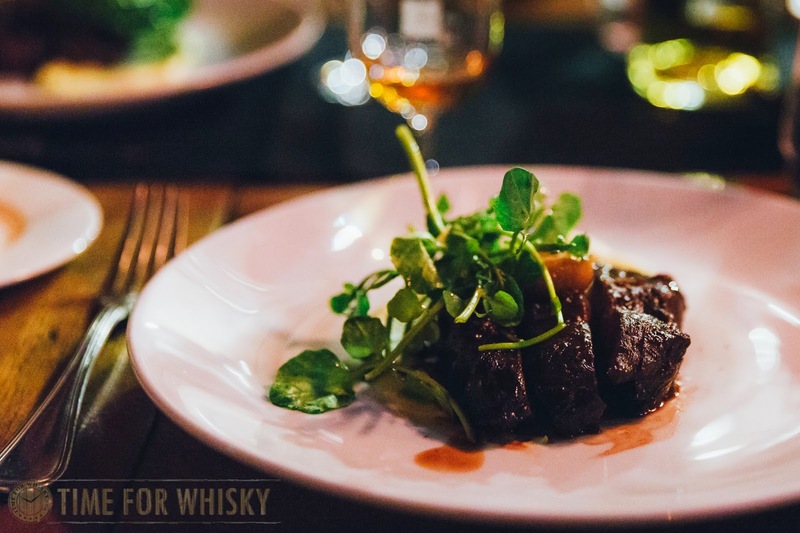 What made the night a lot more exciting was the pairing of whiskies with all the dishes served on the night, one of which was the flat iron steak. The whisky line-up included the Glenmorangie Quinta Ruban, Glenmorangie Nectar d'Or‎, Glenmorangie Lasanta, Glenmorangie Signet and the star of the night, the Glenmorangie Tùsail. The full tasting notes for Tùsail and Signet are detailed below. To calm the nerves of those anxious to taste Tùsail on the night, Dr Bill called for the Tùsail to be the first expression to be tasted that night. Rating (on my very non-scientific scale): 92/100. 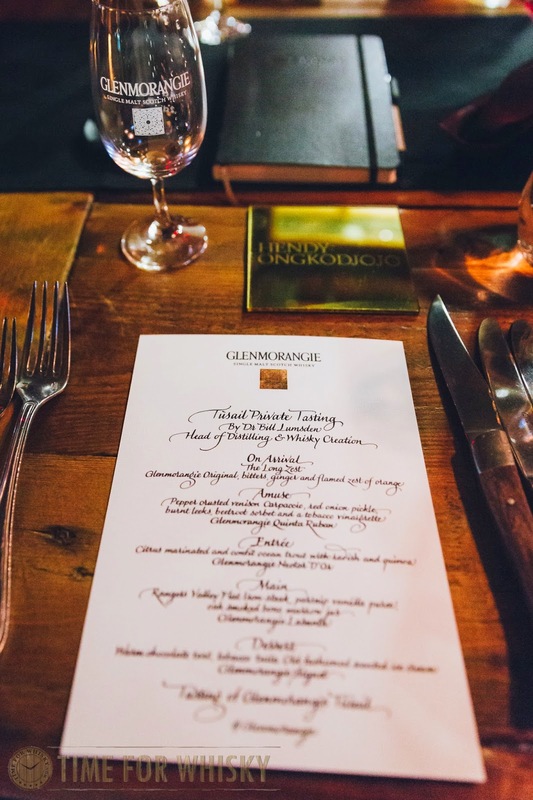 Having tasted the Tùsail, it was then off to the set of courses for the night including the well known Rangers Valley Flat Iron steak as served with parsnip vanilla puree, oak smoked bone marrow jus and paired with a dram of the Glenmorangie Lasanta. The Lasanta paired well with the steak and provided additional sweet notes from having been finished in Oloroso and PX casks. The Lasanta, though, did contrast with the two previous expressions, the Quinta Ruban and the Nectar d'Or. The Quinta Ruban being quite deep, rich, sweet and complex and the Nectar d'Or, being full of dried spices and sweetnesss. 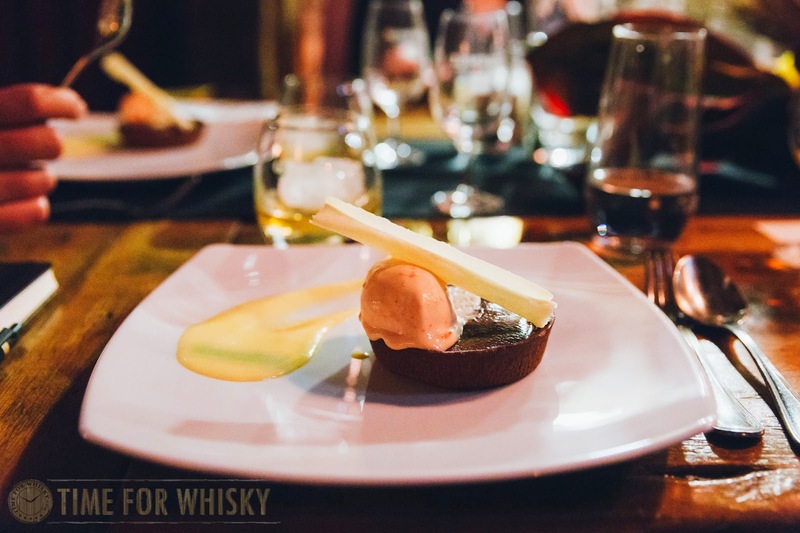 The Glenmorangie Signet was paired with the last course of the night, the dessert course. The richness of the Signet complemented the warm chocolate tart with the added old fashioned scented ice cream. The espresso notes inherent in the Signet bode well as a pair to the warm dessert and also as a final expression for the night. A deep, mysterious expression that takes its inspiration from a good fresh roasted brew in the morning. An expression that smells as good as it tastes. Finish: The finish is long, mouth-coating and fresh. The finish leaves you salivating for more. Tùsail retails for $165AUD and can be purchased through specialist whisky shops (think Oak Barrel, World of Whisky etc...) or online at the Moét Hennessy Collection. TimeforWhisky.com would like to thank EVH for the invitation to what was a remarkable and memorable night with the one and only, Dr Bill Lumsden of the Glenmorangie Company. Tokyo Bird, who opened in Sydney's Surry Hills earlier this year, quickly established themselves as the place to drink Japanese whisky in Sydney. Owners Tina and Jason (close friends of this blog) have done a great job and, with a huge amount of hard work, built a great little neighbourhood bar. 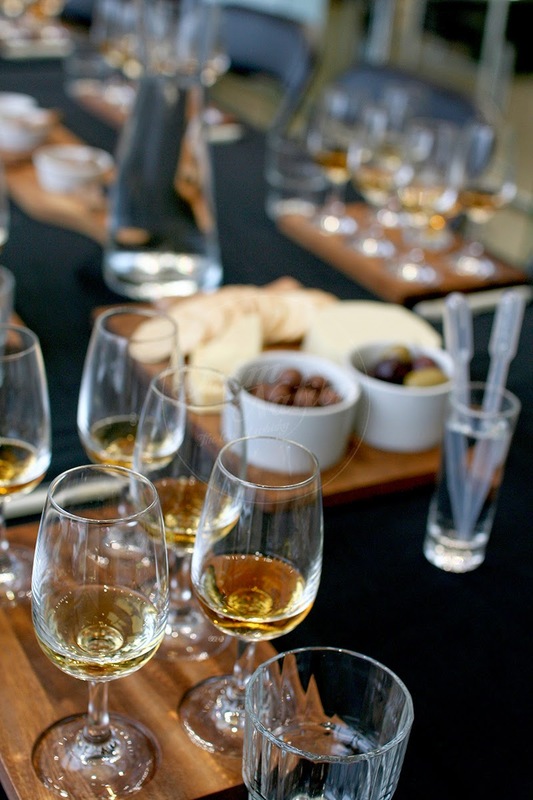 Now to emphasise their passion for whisky, and celebrate World Whisky Day, they're inviting whisky fans and those new to whisky to try one of two tasting flights, taking into account Japan, Australia, Ireland, USA and (of course) Scotland. 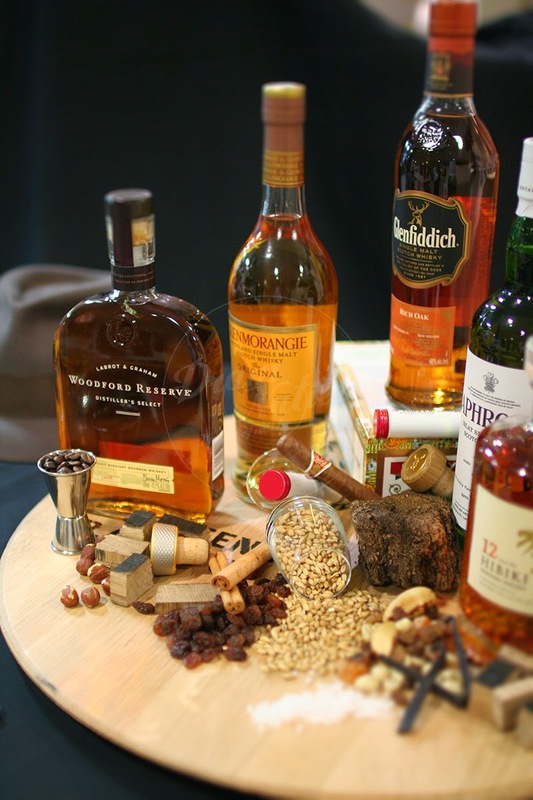 Saturday, 16 May 2015 is the official World Whisky Day around the world – a global day of celebration for whisky, whiskey and all their deliciously drinkable cousins. World Whisky Day invites whisky fans and those who have never tried whisky to try a dram and celebrate the water of life. It's about making whisky fun and enjoyable, celebrating all types of whisky/whiskey from anywhere in the world and encouraging everyone to enjoy whisky responsibly. Surry Hills small bar Tokyo Bird is taking World Whisky Day literally with tasting flights traversing the world of whiskies: from Japanese whisky (of course!) to Irish whiskey and Scotch whisky, and even American bourbons. A three- or five-taste whisky flight will be available from the official World Whisky Day –Saturday, 16 May – through to Wednesday, 20 May. Whisky nerds and newbies alike will receive background and tasting notes, and drinking and food recommendations as they tour a world of whiskies. Bookings for World Whisky Day tasting flights from Saturday, 16 May to Wednesday, 20 May are available via info@tokyobird.com.au"
Even if you can't make it for the World Whisky Day celebrations, we highly recommend dropping by Tokyo Bird in Belmore Lane for a dram or two (and maybe some yakitori skewers) at some point. 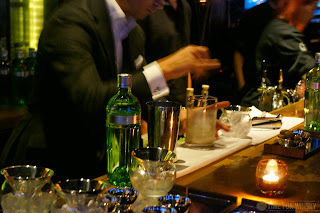 The last Tokyo bar visited as part of our JapanTour14 (before we moved onto whisky bars in Kyoto, Osaka, Hiroshima, Niseko and Sapporo - all to be reviewed soon) was The Society, part of the Park Hotel, not far from Tokyo's Ginza district. 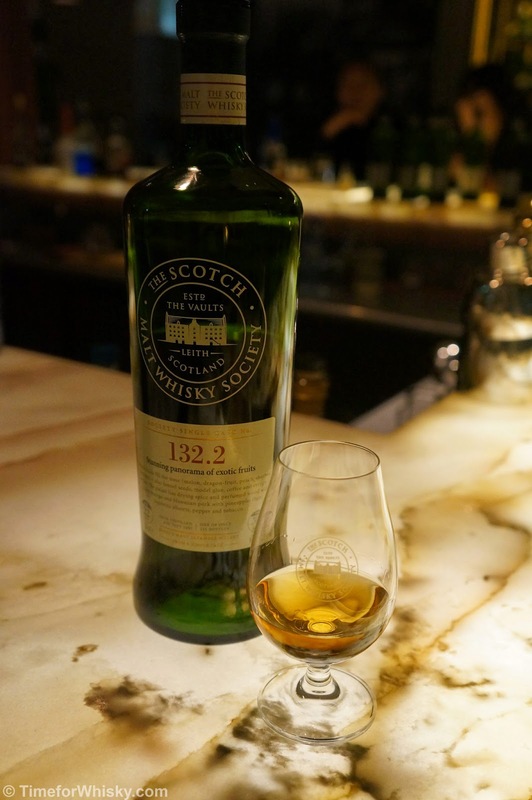 Conveniently located a short walk from the excellent Campbelltoun Loch, The Society is, as the name suggests, an official Scotch Malt Whisky Society bar (the first in Japan). 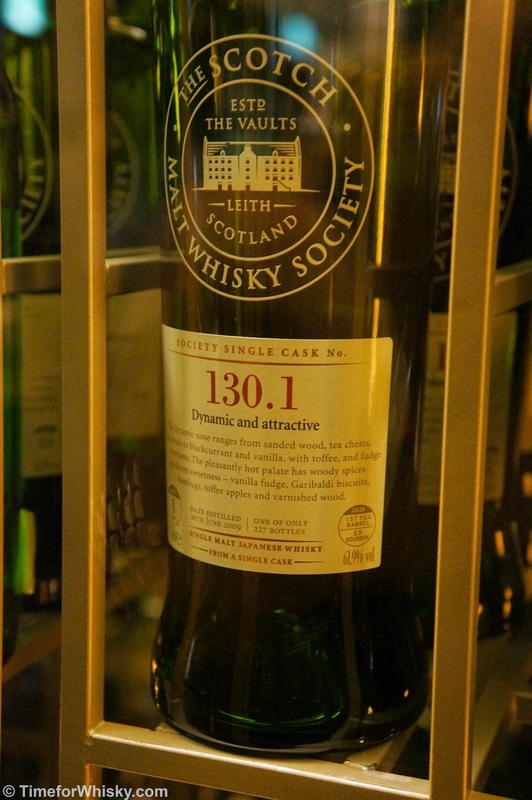 As you might expect, there's a large (100+) selection of the famous green SMWS bottles, and if you don't feel like an SMWS expression...too bad! That's the only whisky on offer. 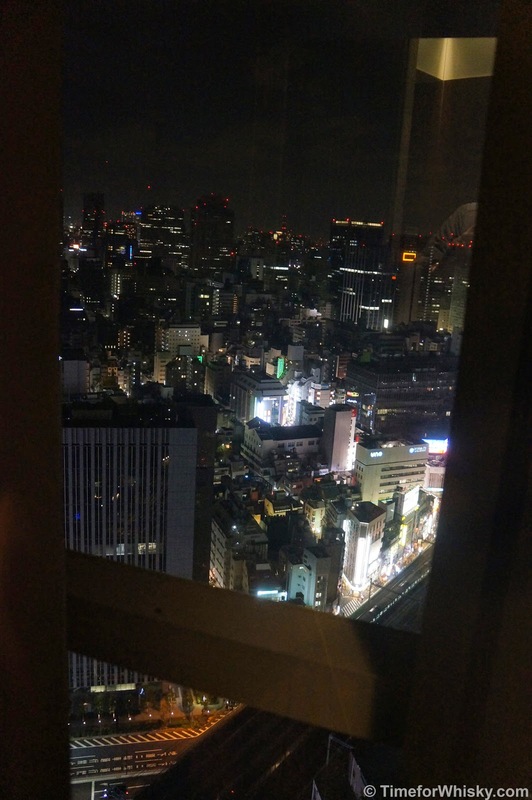 The dimly-lit and elegant venue has an illuminated marble U-shaped bar as its centrepiece, commanding views over Tokyo, and a wine rack absolutely full of SMWS bottles. 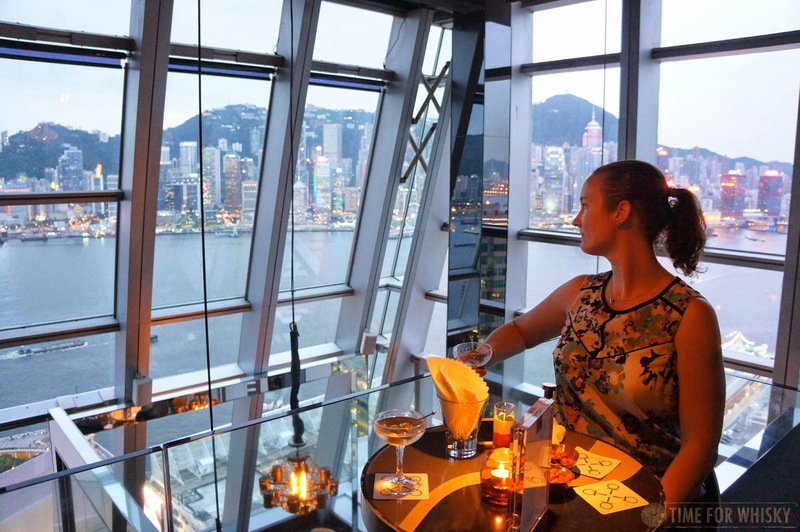 It does feel ever so slightly like a "hotel bar" (albeit a very nice one), but you quickly forget that once you gaze at the menu, and realise what's on offer. 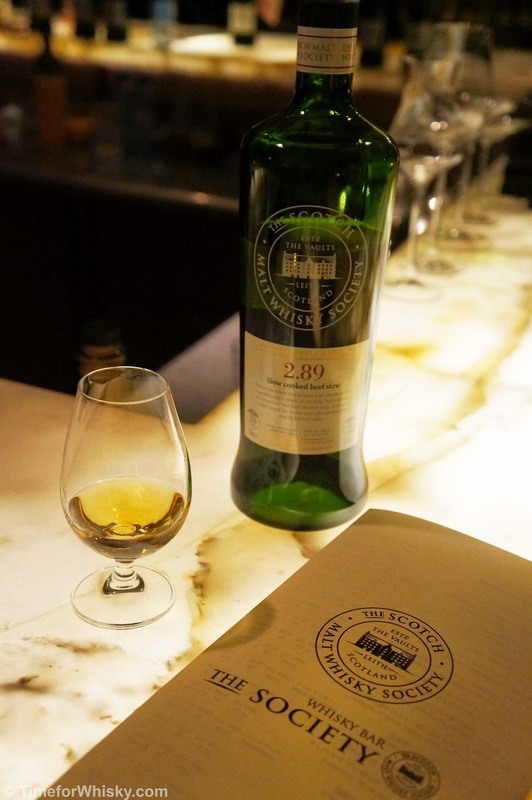 The standard menu contains a smattering of interesting SMWS drams, but it's the secret or member's menu you really want (to see that, show your SMWS membership card, or strike up a conversation with the bartender and hope for the best). 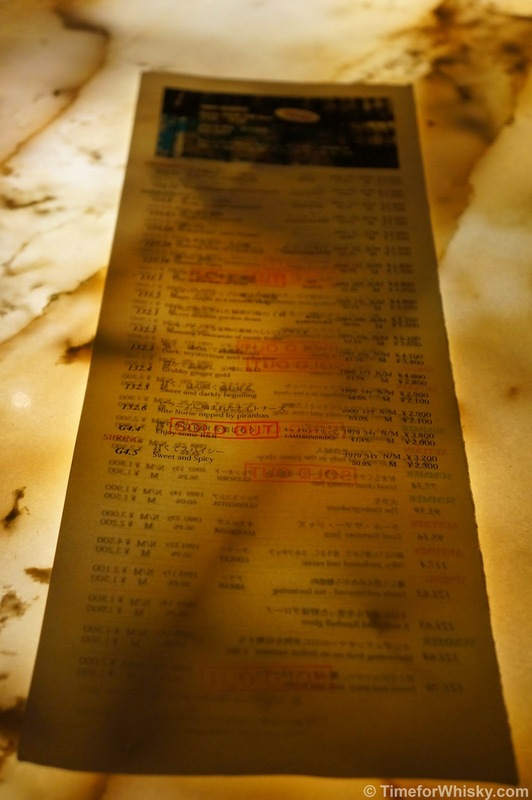 Here you'll see Karuizawas and a number of other Japanese SMWS expressions - none of which feature on the regular menu. Drams are served in official Society glasses (naturally) and while the bar didn't offer half-drams like most Japanese whisky bars, the prices were still very reasonable considering the rarity and quality of the drams on offer (for example - 6 Karuizawas, 132.1 to 132.6, ranging from ¥2100 to ¥5500, or $22AUD/$125HKD to $57AUD/$350HKD). Some drams were available for as little as ¥1400 ($14AUD/$90HKD) at members' prices, which was up to 40% cheaper than the non-member pricing. The website states no cover charge, but I'm sure we paid a ¥1000 cover charge each (which is pretty standard for a number of smaller Japanese bars), so perhaps they've changed the policy. I'm back there in just over a week, so will confirm then. 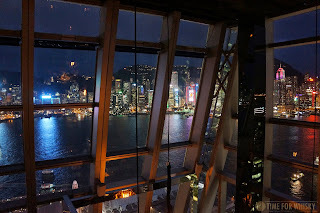 There's not really much else to say about the bar - if you like whisky, would like to try some of the rarest, single cask, cask strength Scottish and Japanese malts around, in pleasant surroundings with great views over Tokyo, it's hard to look past this place.